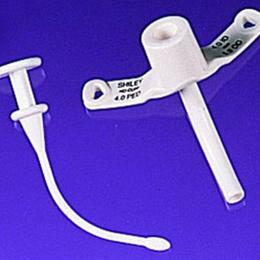 The Neonatal Tracheostomy Tube (NEO) is made of a soft flange materialfor comfort and features a lower flange angle to improve fit in infantpatients.The Pediatric Tracheostomy Tube (PED) has a recessed areabehind the connector and soft flange material to provide greatercomfort and fit for pediatric patients. The Long Pediatric TracheostomyTube (PDL) offers a longer cannula and soft flange material to fitlarger pediatric patients. Each neonatal and pediatric tracheostomytube comes with its own obturator. Smooth, rounded-tip obturatorfacilitates insertion. Designed for use to bypass upper airwayobstructions, provide long term ventilation, support and/or managetracheal/bronchial secretions.